Augumbe is a must-visit place in Karnataka for many reasons. It is green, it is serene, it is wild, it is gushing and above all, it is a place that refreshes you and fills within you a renewed love for life. Situated in Shimoga district, Augumbe stands at a height of 2725 feet above sea level. 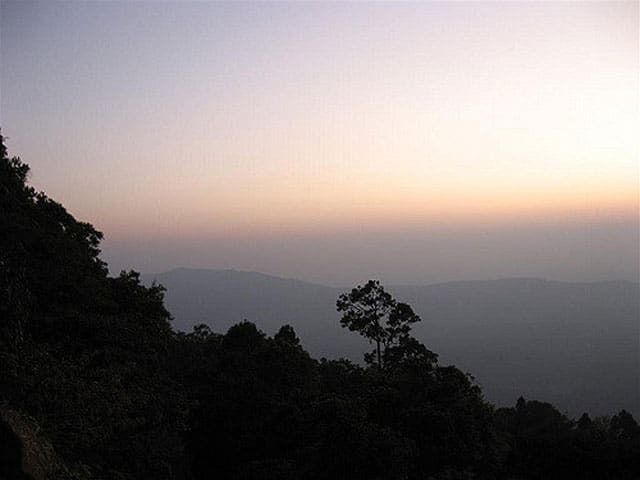 It receives heavy rainfall all through the year, a reason why Augumbe is also known as the ‘Cherrapunji of South India’. But it is preferable not to visit Augumbe during monsoon months but from November to January as the cold months are the best time to visit. Another unique fact about Augumbe is that it was the setting of Malgudi, the fictional village from R. K. Narayan’s book, ‘Malgudi Days’. The house of the main character Swami, which was shown in the TV series based on the book, still stands at Augumbe and is known as Doddamane. There are many picturesque places to visit in Augumbe, but the must-visits are as listed below. It is not just one of the most famous spots in Augumbe, but also worldwide. If one of the best sunset points are to be included, Augumbe’s Sunset Point will definitely find a mention. Atop one of the highest peaks located in the Western Ghats, the Sunset Point gives a splendid view of the sun setting in the Arabian Sea. The colour of the sun as it slips into the sea looks amazingly wonderful from the Sunset Point. It is definitely an experience you will cherish for a long time. It is only a 10-minute walk from the village of Augumbe. From here, you can also get a beautiful panoramic view of the entire area. Though relatively small compared to other rainfalls, Jogigundi Falls has water all through the year, unlike some Falls, which you can see only during monsoon months. It is because the region receives heavy rainfall throughout the year. It is called as ‘Jogi’ because it is believed that a Jogi or a saint meditated here years ago. A unique feature that makes Jogigundi Falls special is that it emerges from a cave, and hence it is also known as the cave waterfall. The water fall is soft and a pond is formed at the bottom. You can also swim in the pond if you wish and it is safe also as the waterfall is not very steep and there are no strong currents. Yet, it is advised not to go too deep and to be careful as there can be sharp rocks in it. It is also a beautiful location with lush trees, orchids, and wild flowers surrounding the place. Located within the Augumbe Rainforest, it is one of the renowned research institutes in India. The Agumbe Rainforest Research Station lies in the Malnad-Kodagu region, which also houses many sanctuaries, including Sharavati, Mookambika, Someshwara and Bhadra wildlife sanctuaries. It is located 560 m above the sea level, and was set up mainly to conserve the rainforests in the south. The rainforests are also famous for one of their main inmates, the King Cobra. It has also rescued more than 100 king cobras over the last few years itself. There are also many projects that the Station has undertaken with a view to conserve, protect and promote ecology in the region. A main attraction of the Augumbe Rainforest Research Station is the small hydroelectric plant that works on solar energy, in keeping with the eco-friendly climate of the institute. There are many reasons to visit the Research Station, one is that it is a place which is striving to conserve ecology for our future and second, to experience the unique rainforests with its flora and fauna. Descending from a height of 300 feet, the Koodlu Theertha Falls is one of the spectacular waterfalls in Karnataka. A pond is formed at the site where the water falls. Locals consider the pond to be holy as it is believed that in ancient times, sages used the place for meditation and penance. It is not just the beauty of the waterfalls that make this an ideal destination for tourists, but also the surroundings that offer a serene and tranquil atmosphere, where you can relax just by standing there and looking around. You hear no sound except for the gushing sound of the water. It is also known as Sita Falls, as it originates from River Sita. Though visitors are allowed to bathe in the pond, it is advisable to stand far from the point where the water falls, because the it falls with such a force that if at all it happens to fall on your head, you may not be able to withstand it and it can be very painful. 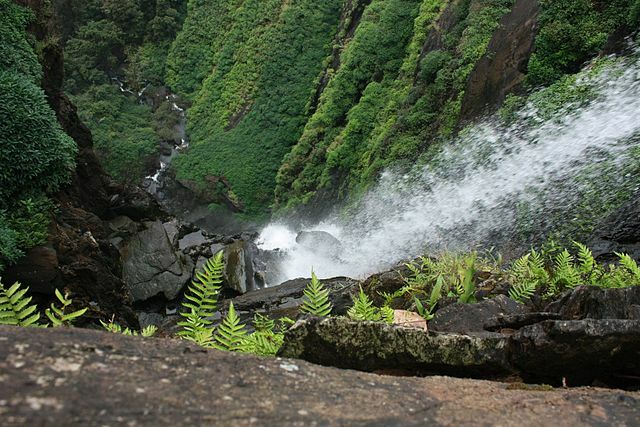 Also, it is only through a trek through forest that you can reach the Koodlu Theertha Water Falls. August to December that is the period after the rainy season is a suitable time to visit the Falls. Onake means a stick used for pounding rice and other foodgrains, and may be, the resemblance of the water route to the stick is the reason for its name. Not only are the Falls mesmerising to look at, you can also get a great view of the surroundings from this place. The Augumbe Sunset Point is close by and you will have to trek at least for 4 kms to reach the Falls. You can hear the roaring sound of water as you reach nearer. The long trek is worth it because of the beautiful view Onake Abbi Falls welcomes visitors with.